My daughter and I were supposed to go rock climbing in Pinnacles today, but after going to bed early the night before, she came into my room around 11:30p to ask if we could cancel - she had school stuff she wanted to take care of. Sure, no problem. I was up early anyway, deciding I should go hiking by myself. I figured I'd pick something that she wouldn't be interested in, and probably few others for that matter. I settled on Peak 2,809ft, an unnamed summit in the Diablo foothills of Santa Clara County. It lies in the shadow of Mt. Hamilton, and is fairly hidden by higher summits to the north and west as well. It is most easily approached from the east via paved Kincaid Rd, a spur road off SR130, the Mt. Hamilton Rd. The problem is that the peak lies on private ranch land and parking on Kincaid Rd is most conspicuous. A more roundabout and adventurous route starts from Joseph Grant County Park to the west, dropping to Smith Creek and climbing Peak 2,809ft from that side. It was this route I intended to use but I didn't leave home until after 9a to give the air time to warm some and the grasses time to dry. It was 10a by the time I had reached the parking lot on the eastern edge of the park and started off on foot. The route is about 3mi each way, the first two miles an easy walk along a ranch road that serves as a trail. From the start, it was evident that cows currently have the run of the park. I had expected tall grasses and an abundance of wildflowers, but all had been cut short with hardly a flower to be found. The cattle had made a mess of the trails and surrounding hills, and were mostly sitting around looking fat and stupid. I'm guessing the extra cattle deployed this year are part of a fire management plan to help with the dangers later in the year. The ranch road heading north goes around the west side of Peak 2,844ft, so I had to make a small diversion from the road to take in the bonus summit along the way. It was partly cloudy today and views somewhat hazy, but there is a good view of Mt. Hamilton to the east and Peak 2,809ft to the north. I studied the slopes of the latter to find an open route up from the creek as this would be the tricky part. I continued on the trail for another half mile or so until it reached a low point at a saddle where it was time for the cross-country fun. I had used this route years ago to reach Mt. Day, so I knew all about the Smith Creek "fun". For one, the slopes into and out of the canyon are terribly steep. With such a wet winter, I was worried that the slopes might be a mud-fest. As it turned out, they were indeed saturated, but they had excellent purchase and my boots would stay relatively dry. Bigger concerns were watching out for poison oak which is rampant in these parts, a high and swift-flowing stream, and ticks that are often found down by the streams in the Diablo Range. I had come prepared with extra clothing for the drive home should I need to change due to the poison oak, but I found that by picking my way carefully down and up the slopes, I could avoid the stuff for the most part. The lower half of the slopes are more tree-covered, with cool, moss-covered oaks that give the place an eerie, old-world look, almost as if gnomes and elves might pop up from behind a tree at any time. Upon reaching the creek, I found the water flowing high and fast, much as expected. Most places were too deep to consider crossing, but there were some more reasonable spots where I wouldn't go up past my knees. While looking around I spotted a convenient set of logs that would help me cross the creek without having to take my boots off. This was a great find that saved me time and effort. There was more looking around to find a place to get up out of the creek on the other side. Most places seemed to have a wall of freshly-leafing poison oak, but eventually I found suitable means and began making my way up the opposite side of the canyon. I came across an old barbed-wired fence that ran vertically up the ridgeline I was ascending. For the most part it was intact, but there were enough breaks in it to make it useless to keep cattle on one side or the other. The fence was so old that it had grown virtually through the center of the manzanita and oaks that it was tied to. No signs indicating No Trespassing found anywhere - even with no one around for a few miles, I'm always looking for plausible deniability. 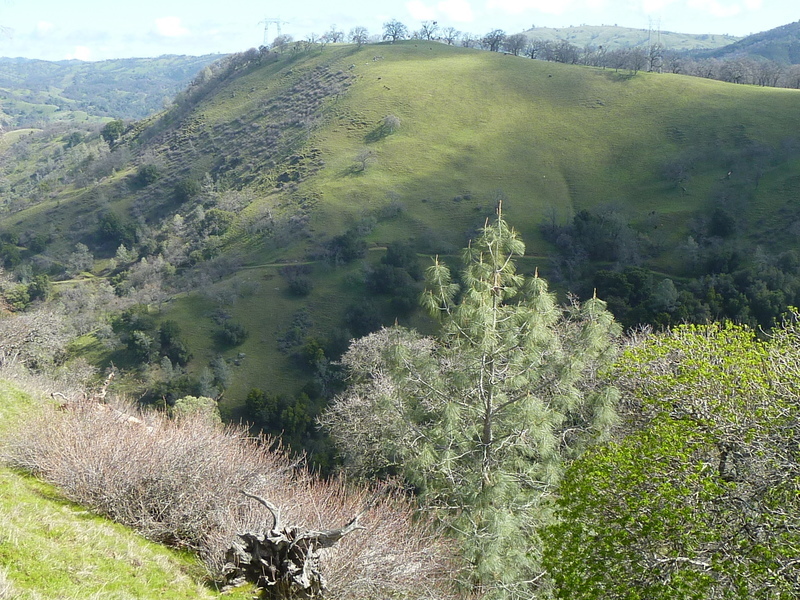 Once up a few hundred feet, the ridge/slopes grow more open, mostly grass but still poison oak to avoid. There is an old ranch road on this side of the mountain that switchbacks up the hillside. I used it for a few turns, then abandoned it when it seemed to head north away from the summit. The final 400ft or so of slopes featured a healthy collection of poison oak bushes that I needed to weave my way through. The steep gradient finally rolls off only as one reaches the summit. A transmission line goes over the top, one tower a short distance to the north. A ranch/utility road can be seen immediately to the east of the summit - clearly the easiest way to the top, but it made me nervous looking at, wondering if an ATV or truck was about to rumble by to look after the cattle grazing on nearby slopes. Antler Pt and Mt Day can be seen to the north on either side of Smith Creek, the highest summits in the immediate area. Having reached the top just before noon, I beat a retreat back down the same route without staying more than half a minute up there. Not wanting to find more poison oak than I could handle, I closely followed my ascent route back down to Smith Creek, crossing at the same logjam I'd used earlier. In climbing back out of the creek up to the park, I found a better line that had more grass, less trees and poison oak. I also managed to pick up a few ticks that I flicked off, hoping there weren't more in hiding (I did a more thorough check for the buggers back at the TH and again at home). The cows were still lazily hanging out along the park trail on the crest when I returned there, others resting under the oaks or slowly munching grass - if they only knew what ultimately was in store for them. I finished up by 1:30p and with everything pretty much going as planned, I took about 3.5hrs all told.